Tents & Events has a clear mission . . . to provide our customers with the best in event consultation, equipment selection, and service to ensure the success of your event! We began in the rental industry over 30 years ago, with several Taylor Rental locations, providing local homeowners with lawn and household tools, as well as, party rental items such as canopies, tables and chairs. About 15 years later, as the demand for Party Rentals grew, the decision was made to abandon the tool rental business, to focus our efforts solely on the Event Rental Industry, and Tents & Events was born! 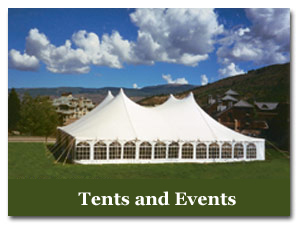 Tents & Events now boasts a vast inventory of Pole Tents, Frame Tents, and Do-It-Yourself-Canopies, as well as, Tables, Chairs, Stages, Pipe & Drape, China, Glassware and more! We own a complete line of linens, which we launder and press on site, enabling last minute linen requests to be made! Our flexibility enables us to assist you with your small dinner party for 10, or handle a large-scale Corporate Event for several thousand. Request your quote today!